The Armchair Theatre is a well established little venue in Obs, Cape Town that has remained popular by constantly innovating with their marketing in very practical ways. Their latest promotion on their MySpace page is as practical as it is innovative. Get free entrance to The Independent Armchair Theatre by reviewing the next show you go to. All you have to do is post a review in our Myspace comments section. This will get you 1 x free entry. The next time you arrive at The Armchair your name will be on the guest list. Your review then gets posted on their website - so they get lots of reviews for free, while also attracting opinion leaders (who care enough to write reviews) for a follow-up show. The reviews get republished on their main website to give the reviews even further reach... Effectively Turning Customers Into Evangelists (<< click if you didn't get the obscure reference to a funnel in the title of this post). Buzzword of the day: Prosumer. It's been around since the 70's when Alvin Toffler proposed that consumers are becoming producers - in other words that they're getting involved in customizing their experiences of products and services to their tastes in ways that large companies couldn't. Of course, this idea of "Prosumerism" is gaining serious ground thanks to the internet where even our love songs can be customized to suit our tastes, and where customers are even producing adverts on behalf of the brands they love (or hate). Adidas recently did a campaign where they put up blank white billboards with a small logo, inviting graphiti artists to come and spray and write on them. 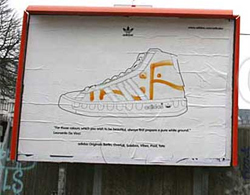 Then after a while they placed another poster with a hole in the shape of a shoe on top of the graphiti - hence showing a one-of-a-kind shoe ad co-created with Adidas and their target market. Awesome. Consider next time you're doing an ad how you could get people to interact with it and customize it to their taste.